is indicative of being Anointed the Successor to the Throne." According to popular Vietnamese Legend, the Peoples of Vietnam descend from the Dragon King Lac Long Quan and his wife, the Water Fairy Au Co.
Mythological, fantastic, a Symbol of Kingship, Sovereignty, Wisdom, Good Luck and Health; endeared and revered as a creature of fantasy, imagination and intrigue, the Dragon is the most important and Sacred Symbol of Vietnam. Endowed with Mystic and Supernatural Powers [Tu Linh] - and known in Vietnamese as Con Long, or Con Rong - the Dragon is quite often the essence of many traditional Stories, Tales, Fables, Legends and Myths. A Traditional Symbol of Kingship and Sovereignty, the Bestowal of the Dragon Ring is indicative of being Anointed the Successor to the Throne; it is an Insignia Ring worn to designate one's Blessing, Authority and Jurisdiction. Throughout history, the Dragon Ring was often used by the Emperor to Seal Public Proclamations and other Official Documents; oft-times it was also affixed onto private correspondence. To ALL and SUNDRY throughout the Realm, sighting the Emperor's distinctive Imprimatur was sufficient enough to obtain and compel the consent of Court Attendants, Officials, Government Authorities and the general populace throughout the Land to accede to and obey the Emperor's Declarations, Commands, Summons and Edicts without question. Formerly belonging to the late Emperor Khai Dinh - who reigned from 17 May 1916 to 06 November 1925 - the Dragon Ring is the most treasured and Sacred Heirloom and possession of the Imperial Nguyen Dynasty of Vietnam which today now has a new Prince Regent His Imperial Highness Prince Regent Nhiep Chinh Nguyen Phuc Buu Chanh of Vietnam. 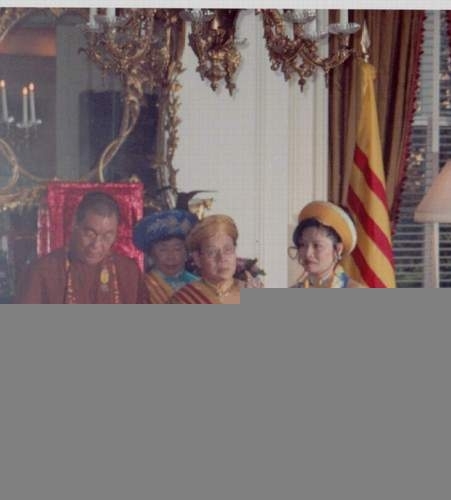 On Saturday 17 July 2004, at a solemn ceremony held in Washington DC – USA, The Most Venerable Hòa Thng Thích Giác Minh presented His Imperial Highness Prince Nhiep Chinh Nguyen Phuc Buu Chanh of Vietnam with the Imperial Nguyen Family Dragon-Ring. This most treasured and sacred Imperial Family gold ring, formerly belonging to the late Emperor Khai Dinh. This scared ring was presented in the presence Her Imperial Highness Cong Nuong Princess Phan Lien, Respectable and Loyal Members of the Imperial Nguyen Family, Official and Honorable Guests, Respected Religious Venerables, Respected and Imperial Dignitaries, High-Ranking Military Officials and Members of the Vietnamese Diaspora. The Dragon Ring - customarily presented by the Dowager Empress to the Anointed Successor to the Throne - had long been entrusted to the custody of the Most Venerable Hoa Thng Thich Giac Minh by the Dowager Empress Doan Huy Hoang Thi Hau Tu Cung, who was the Consort of the late Emperor Khai Dinh, and the mother of Vietnam's last Reigning Monarch, the late Emperor Bao Dai. Effective from the date of this most Solemn and Significant Ceremony, His Imperial Highness Prince Nhiep Chinh Nguyen Phuc Buu Chanh of Vietnam became Prince Regent and - acting by official mandate and authority accorded by Imperial Edict of His Imperial Majesty Bao Dai, the late Emperor of Vietnam, and with adherence to his prerogatives, rights and responsibilities as Regent of Vietnam - he became the rightful and legal Grand Master of the Imperial Order of the Dragon of Annam. PLEASE NOTE: The Imperial Vietnamese family in now headed by His Imperial Highness Bao Thang, who assumes the headship after the recent passing of his elder brother His Imperial Highness Bao Long.